Advertising features in Google Analytics are hugely useful for creating remarketing audiences. However, to comply with GDPR, it is necessary to block these features in some cases: to ensure that users always opt in before you collect, store, or use their data. In just a few steps, you can both enable and block advertising features. To enable remarketing and advertising reporting features for a property, you’ll need to have edit permission for that property. You’ll also need to agree with the Analytics Terms of Service — if you haven’t since these terms last changed. Finally, you’ll need an active Google Ads or Display & Video 360 account linked to your Google Analytics account. In the case you want to use Google Ads, you’ll need to add your audiences to an ad group. Once you’ve done this, you have a variety of options to add advertising features. The first solution is to modify your property settings — this is the only way to use the Analytics tag to create remarketing lists. 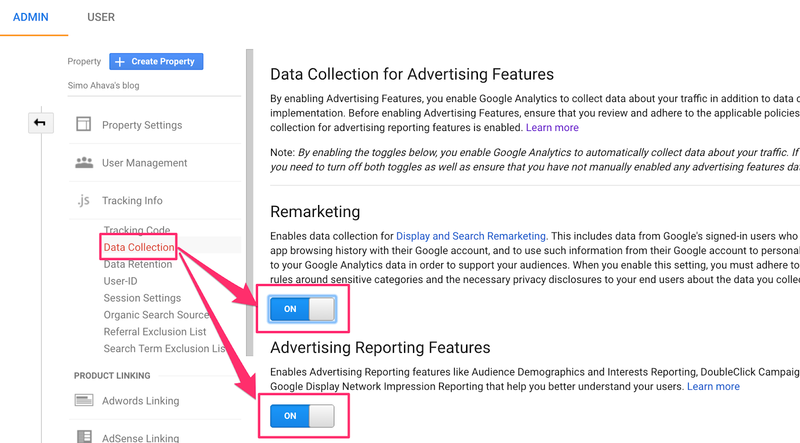 To do so, head to “Admin” and choose “Property.” Then, click on “Tracking Info” and select “Data Collection.” Here, you can turn on both remarketing and advertising reporting features or just the second option. The require command functions the same as property settings. The difference is now you can decide when you want the plugin to load. Yet another method is to enable display advertising features in Google Tag Manager. Under “Advertising,” set the option to true. A final alternative is to use existing tracking code. This is an option if you are creating a Google Ads remarketing campaign with an account linked to your Google Analytics account. By using the tracking code already on your website, remarketing is automatically enabled in Google Analytics. To ensure that you comply with GDPR, you need to gain consent from users before you can keep, store, or use their data. This means that you are unable to remarket to users unless they opt in. Alternatively, you can use Google Tag Manager. Head to “More Settings” and then “Fields to Set.” Create a new field with the name “allowAdFeatures” and the value “true/false.” Then, use a variable that checks for user consent and returns either true or false. Configuring advertising features is critical if you want to improve your remarketing efforts and ensure that you comply with GDPR. The good news is that there are several methods to use, allowing you to find whatever is easiest for your site.